Another fun day of giveaways here at iheartcleveland! During the holidays is it hard to make time for “you?” Does your workout, your alone time, meditation and spiritual needs, do they all fall to the side in place of holiday hustle and bustle? Have you ever tried Yoga? A state of wonderful deep stretching and strength training paired with meditative deep cleansing breathe partnered with a state of peace and well being? I’ve been practicing for almost ten years and still a beginner I can’t stress enough how yoga brings me joy, keeps me grounded, makes me stronger, brings me peace and stretches every muscle in my body. Sounds good right? For Day 3 in the 12 Days of Giveaways, Rocky River studio, Inner Bliss Yoga is offering 5 class passes ($60 value) to one VERY lucky reader. This offer is the perfect opportunity to try yoga, to come back to yoga (“return to your breathe”) or perfect your crow, eagle or tree pose. At Inner Bliss they offer many types of classes, from child and very beginner to powerflow and hot experiences. Their kind welcoming teachers create an environment of acceptance, vibe of joy and lots of fun. Their studio (located on the second floor at 19537 Lake Road) invites light and warmth into your daily practice. During these chilly Ohio days stepping into the IB studio warms not only your body, but your soul. Check it out! “Like” Inner Bliss on Facebook and tell us about your thoughts or experience with yoga. (What do you like? Why are you hesitant? What holds you back? What drives you for more?) and enter to win today! Please include your email, winner will be drawn on Tuesday December 13th. I can’t wait to read your comments on this one. 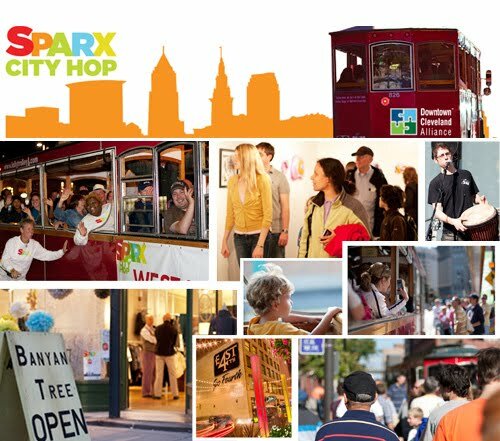 Sparx City Hop is a free all day event that celebrates the visual, culinary and performing arts of Cleveland’s most central and metropolitan neighborhoods. Free trolley service by Lolly the Trolley allows individuals and families to “hop” through the neighborhoods of Downtown (Historic Gateway Neighborhood, Historic Warehouse District, PlayhouseSquare and the Campus District) plus the districts the connect directly to Downtown (Tremont, Ohio City, MidTown, AsiaTown and St. Clair Superior). The trolley routes connect people to over 70 galleries & artist studios, over 100 restaurants, several markets and dozens of specialty retail shops. In addition, Sparx City Hop connects participants to a variety of sidewalk concerts, main stage performances, special gallery and studio events, the Terminal Tower observation deck (see details below), the Tower City Street Fair, the Sparx Classic Car Show, a variety of merchant specials and so much more. How did it get to August already? Weren’t we just planning our afternoon trips to the beach? Or what we’d pack on our evening picnic? Well, not to worry, we still have all of August and most of September keep up warm and enjoying the Cleveland outdoors. This weekend what are you doing? So many great area events it makes me wish I could be in two places at once. > Artists from all over Ohio will meet to sell their work in Lakewood…check out the Grey Cardigan pop up shop! > E.T lands at Huntington Beach, while Dorothy and the munchkins take over Playhouse Square. > A memorial show to our dear Cleveland friend, Harvey Pekar at the Beachland Ballroom. > Grab your bike and take an evening ice cream ride to your best neighborhood ice cream shop! > Cheers on our area athletes at this years Cleveland Triathlon. > I’ve been craving a crepe, a pot of french press and the Sunday morning paper in the city. > A big street bash in the Warehouse District! > Rent a kayak and paddle through the Rocky River to keep cool! > How about a $5 Mojito to ring in the new week? Well, whatever your weekend has in store for you, make sure you are happy, healthy and surrounded by those you love. Happy iheartcleveland weekend!